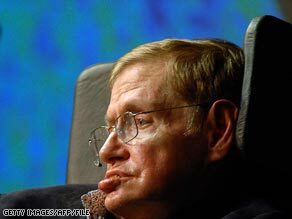 CAMBRIDGE, England (CNN) -- Professor Stephen Hawking, one of the world's great scientists, is looking to the stars to save the human race -- but pessimism is overriding his natural optimism. Stephen Hawking, here delivering a lecture in May, spoke recently to CNN about his vision of the future. Hawking is one of the few scientists known to a wide audience outside academia thanks to his best-selling books, a guest spot on "The Simpsons" and an ability to clearly explain the complexities of theoretical physics. He has 12 honorary degrees, was awarded the CBE in 1982 and since 1979 has been at Cambridge University's Department of Applied Mathematics and Theoretical Physics, where he is Lucasian Professor of Mathematics -- a post once held by Isaac Newton. "The frequency of such occasions is likely to increase in the future. We shall need great care and judgment to negotiate them all successfully. "But I'm an optimist. If we can avoid disaster for the next two centuries, our species should be safe, as we spread into space." Twenty years ago, Hawking wrote "A Brief History of Time." Now he is looking forward to a space flight of his own next year. He said: "I don't think the human race has a moral obligation to learn about space, but it would be foolish and short sighted not to do so. It may hold the key to our survival."